Stour barges, or lighters, featured in many of Constable’s most famous paintings depicting the working river and our restored lighter has been named in his honour. Passenger services were officially launched by River Stour Trust Vice President, Griff Rhys Jones, in May 2013. The John Constable Lighter is available for private charters and as a ‘floating classroom’ for educational visits; subject to existing bookings and commitments. 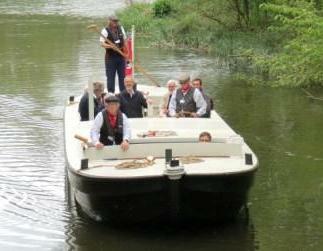 You can find out more about the boat and its restoration by clicking here. The John Constable is an open boat so it is not covered in the event of rain so lightweight, disposable waterproof ponchos are available onboard. Our newest addition to this craft is a purpose-built canopy that can be fitted before your journey to act as shelter from the rain or the sunshine! All trips are dependent on availability, weather and river conditions. The John Constable is particularly susceptible to bad weather/stream conditions and trips could be cancelled at short notice to ensure the safety of our passengers and volunteers. Our boats only operate within civil twilight hours for safety and insurance reasons. Visit TripAdvisor to read the reviews and/or leave your own comments.